This assay has high sensitivity and excellent specificity for detection of human Kim-1. No significant cross-reactivity or interference between human Kim-1 and analogues was observed. Small volumes of Kim-1 elisa kit vial(s) may occasionally become entrapped in the seal of the product vial during shipment and storage. If necessary, briefly centrifuge the vial on a tabletop centrifuge to dislodge any liquid in the container`s cap. Certain products may require to ship with dry ice and additional dry ice fee may apply. MBS700484 is a ready-to-use microwell, strip plate ELISA (enzyme-linked immunosorbent assay) Kit for analyzing the presence of the Kidney injury molecule 1, Kim-1, ELISA Kit target analytes in biological samples. The concentration gradients of the kit standards or positive controls render a theoretical kit detection range in biological research samples containing Kim-1. 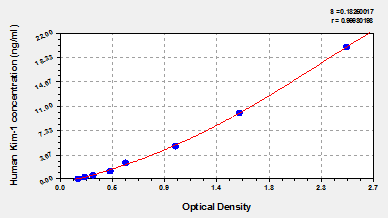 The ELISA analytical biochemical technique of the MBS700484 kit is based on Kim-1 antibody-Kim-1 antigen interactions (immunosorbency) and an HRP colorimetric detection system to detect Kim-1 antigen targets in samples. The ELISA Kit is designed to detect native, not recombinant, Kim-1. Appropriate sample types may include undiluted body fluids and/or tissue homogenates, secretions. Quality control assays assessing reproducibility identified the intra-assay CV (%) and inter-assay CV(%). Principle of the Assay: This assay employs the quantitative sandwich enzyme immunoassay technique. Antibody specific for Kim-1 has been pre-coated onto a microplate. Standards and samples are pipetted into the wells and any Kim-1 present is bound by the immobilized antibody. After removing any unbound substances, a biotin-conjugated antibody specific for Kim-1 is added to the wells. After washing, avidin conjugated Horseradish Peroxidase (HRP) is added to the wells. Following a wash to remove any unbound avidin-enzyme reagent, a substrate solution is added to the wells and color develops in proportion to the amount of Kim-1 bound in the initial step. The color development is stopped and the intensity of the color is measured. NCBI/Uniprot data below describe general gene information for Kim-1. It may not necessarily be applicable to this product. 1. The results suggest that kidney injury molecule-1 (KIM-1) negatively regulates cellular function mediated through interaction with collagen, and MT1-MMP abrogates it through the cleavage and shedding of KIM-1.